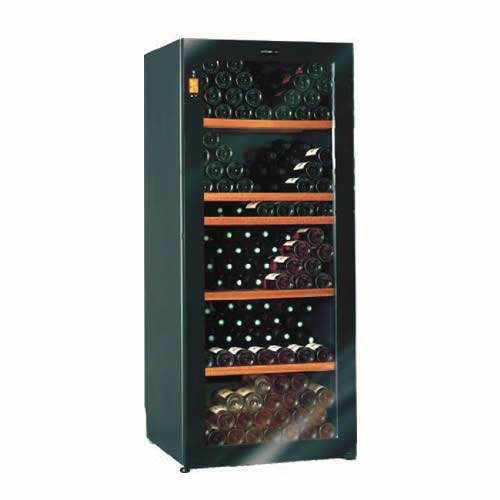 Start off your wine collection the right way with the Climadiff Diva 265 Bottle Multi-Temperature Glass Door Cabinet Wine Cooler (DV265MGN2U, DV265MGN2U-A, DV265MGN2U-B). Perfect for beginner collectors or dinner party host enthusiasts, keep your favorite bottles safely stored away at the perfect serving temperature and ready to use whenever you need them. Built with a compressor cooling system, the additional heating system helps maintain a consistent temperature and allows for an ambient temperature range of 32 to 95 degrees. The free standing cabinet's exterior is made of black metal with a granulated metal interior and has a tempered, seamless, full glass door that offers a very chic feel. Touch screen controls display temperature and humidity, cooling and heating indicator, low water supply alert and operate the low emission LED light system. The activated charcoal filter absorbs impurities and helps eliminate odor, while the anti-vibration system and lock keep your bottles safe. The Diva base package includes four (4) adjustable shelves and one (1) BGN Premium wood self. Bottles can be stacked on sliding shelves, which the unit can hold up to 13 of and up to five (5) presentation shelves. Additional shelving packages can be purchased to meet your display and capacity needs. Keep your wine collection safely stored and at perfect serving temperature, all the while being on display with the Climadiff Diva Multi-Temp Glass Door Cabinet Wine Cooler. Multi Temperature: Achieve the perfect temperature with the unit's three (3) adjustable settings Heating System: Through the automatic heating/cooling system a consistent temperature is maintained which allows for a greater ambient temperature range Electronic Regulation: The unit's digital display offers: temperature and humidity display, cooling and heating indicator, and a low water alert NOTE: This item is delivered using white glove service. Start off your wine collection the right way with the Climadiff Diva 265 Bottle Single Temp Glass Door Cabinet Wine Cooler (DV265AGN7U, DV265AGN7U-A, DV265AGN7U-B). Perfect for beginner collectors or dinner party host enthusiasts, keep your favorite bottles safely stored away at the perfect serving temperature and ready to use whenever you need them. Built with a compressor cooling system, the unit has a single adjustable temperature range of between 46-64 degrees F and allows for an ambient temperature range of 50 to 95 degrees F. The free standing cabinet's exterior is made of black metal with a granulated metal interior and has a tempered, seamless, full glass door that offers a very chic feel. Touch screen controls display temperature and humidity, cooling indicator, low water supply alert and also operate the low emission LED light system. The activated charcoal filter absorbs impurities and helps eliminate odor, while the anti-vibration system and lock keep your bottles safe. The Diva base package includes four (4) adjustable shelves and one (1) BGN Premium wood self. Bottles can be stacked on sliding shelves, which the unit can hold up to 13 of and up to five (5) presentation shelves. Additional shelving packages can be purchased to meet your display and capacity needs. Keep your wine collection safely stored and at the perfect serving temperature, all the while being on display with the Climadiff Diva 265 Bottle Single Temp Glass Door Cabinet Wine Cooler. Temperature Range: Single adjustable temperature unit has an interior range of 46-64 degrees F with an ambient temperature range of 50-95 degrees F Glass Door:Full tempered, seamless and UV resistant door lets your collection stay safely stored for all the world to see Electronic Regulation: The digital control touch screen features a temperature and humidity display, cooling indicator, low water supple alert and low emission LED lights NOTE: This item is delivered using white glove service. 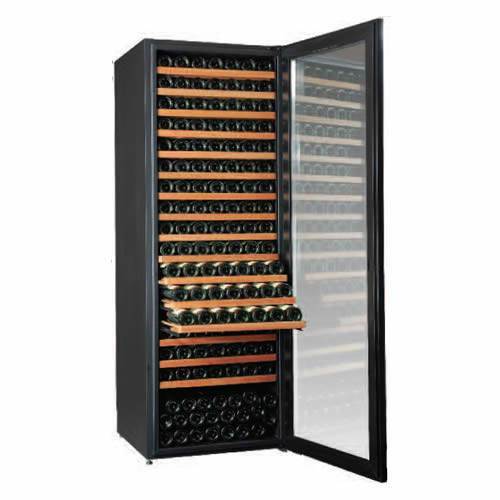 Start off your wine collection the right way with the Climadiff Diva 315 Bottle Multi Temperature Glass Door Cabinet Wine Cooler(DV315MGN3U, DV315MGN3U-A, DV315MGN3U-B). Perfect for beginner collectors or dinner party host enthusiasts, keep your favorite bottles safely stored away at the perfect serving temperature and ready to use whenever you need them. Built with a compressor cooling system, the additional heating system helps maintain a consistent temperature and allows for an ambient temperature range of 32 to 95 degrees. The free standing cabinet's exterior is made of black metal with a granulated metal interior and has a tempered, seamless, full glass door that offers a very chic feel. Touch screen controls display temperature and humidity, cooling and heating indicator, low water supply alert and operate the low emission LED light system. The activated charcoal filter absorbs impurities and helps eliminate odor, while the anti-vibration system and lock keep your bottles safe. The Diva base package includes five (5) adjustable shelves and one (1) BGN Premium wood self. Bottles can be stacked on sliding shelves, which the unit can hold up to 16 of and up to six (6) presentation shelves. Additional shelving packages can be purchased to meet your display and capacity needs. Keep your wine collection safely stored and at perfect serving temperature, all the while being on display with the Climadiff Diva Multi-Temperature Glass Door Cabinet Wine Cooler. Multi Temperature: Achieve the perfect temperature with the unit's three (3) adjustable settings Heating System: Through the automatic heating/cooling system a consistent temperature is maintained which allows for a greater ambient temperature range Electronic Regulation: The unit's digital display offers: temperature and humidity display, cooling and heating indicator, and a low water alert NOTE: This item is delivered using white glove service. 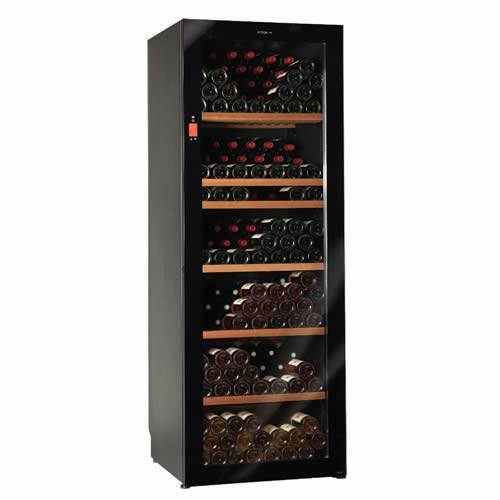 Start off your wine collection the right way with the Climadiff Diva 315 Bottle Single Temperature Glass Door Cabinet Wine Cooler (DV315AGN4U, DV315AGN4U-A, DV315AGN4U-B). Perfect for beginner collectors, keep your favorite bottles safely stored away at the perfect serving temperature and ready to use whenever you need them. Built with a compressor cooling system, the additional heating system helps maintain a consistent temperature and allows for an ambient temperature range of 46 to 64 degrees. The free standing cabinet's exterior is made of black metal with a granulated metal interior and has a tempered, seamless, full glass door that offers a very chic feel. Touch screen controls display temperature and humidity, cooling indicator, low water supply alert and also operate the low emission LED light system. The activated charcoal filter absorbs impurities and helps eliminate odor, while the anti-vibration system and lock keep your bottles safe. The Diva base package includes five (5) adjustable shelves and one (1) BGN Premium wood self. 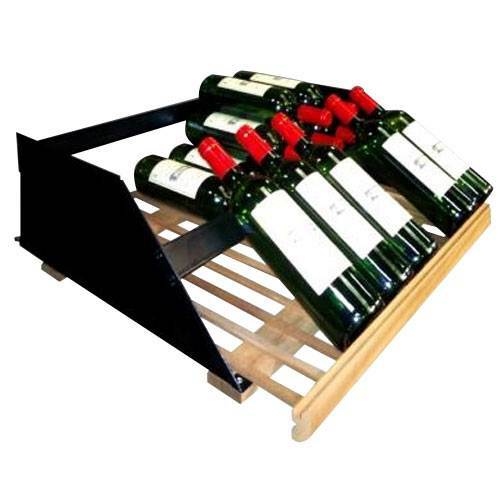 Bottles can be stacked on sliding shelves, which the unit can hold up to 16 of and up to six (6) presentation shelves. Additional shelving packages can be purchased to meet your display and capacity needs. 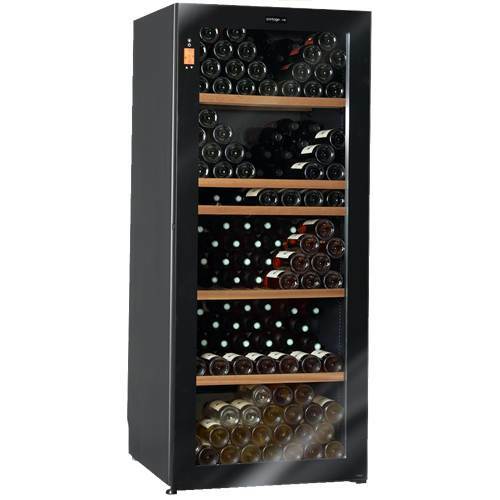 Keep your wine collection safely stored and ready to serve and enjoy at the perfect serving temperature, with the Climadiff Diva 315 Bottle Single Temperature Glass Door Cabinet Wine Cooler. Temperature Range: Single adjustable temperature unit has an interior range of 46-64 degrees F with an ambient temperature range of 50-95 degrees F Heating System: Through the automatic heating/cooling system a consistent temperature is maintained which allows for a greater ambient temperature range Glass Door:Full tempered, seamless and UV resistant door lets your collection stay safely stored for all the world to see NOTE: This item is delivered using white glove service. The sleek contemporary design of the Climadiff Theatrical Multi-Temperature 203 Bottle Wine Cabinet (EV504ZXUL) keeps your wine collection safely stored and ready to show off to your friends and guests. Theatrical style cellar door features a two way mirror picture window with infa red motion detectors that activate the LED lights when motion is detected to light up the display shelf inside. When left unattended, the lights automatically turn off and the anti-UV glass protects the bottles from harmful rays. Inside the cabinet door features a wine registry and compartments for saving and storing corks, labels, and champagne caps. The electromechanical multi temperature interior offers a 46 to 64 temperature range with a serving, aging and cooling area, while the heating system helps maintain a consistent temperature through automatic heating and cooling. With the winter and heating system you can keep the cabinet in an unheated area of your home without having to worry about over cooling, the unit allows for an ambient temperature range of 32 to 90 degrees F. Stabilized hygrometry works with lava rocks to control humidity and the activated charcoal filter helps eliminate odor. Other features include: anti-vibration system, adjustable feet and castors, four (4) wooden shelves, two (2) compartments with half shelves and a top door lock to keep your collection safely stored. Keep your wine collection stored to perfection and ready to display with the Theatrical Multi-Temp Wine Cabinet. Theatrical Door: The cabinet window is a two way mirror with infra red detectors that light up the display window when motion is detected, and automatically shuts off when unattended Multi Temperature: This unit is an electromechanical cabinet with a temperature range of 46 - 64 degrees F Heating System: Through the automatic heating/cooling system a consistent temperature is maintained which allows for a greater ambient temperature range NOTE: This item is delivered using white glove service. Start off your wine collection the right way with the Climadiff Diva 265 Bottle Single Temp Glass Door Cabinet Wine Cooler (DV265AGN7U, DV265AGN7U-A, DV265AGN7U-B). Perfect for beginner collectors or dinner party host enthusiasts, keep your favorite bottles safely stored away at the perfect serving temperature and ready to use whenever you need them. Built with a compressor cooling system, the unit has a single adjustable temperature range of between 46-64 degrees F and allows for an ambient temperature range of 50 to 95 degrees F. The free standing cabinet's exterior is made of black metal with a granulated metal interior and has a tempered, seamless, full glass door that offers a very chic feel. Touch screen controls display temperature and humidity, cooling indicator, low water supply alert and also operate the low emission LED light system. The activated charcoal filter absorbs impurities and helps eliminate odor, while the anti-vibration system and lock keep your bottles safe. The Diva base package includes four (4) adjustable shelves and one (1) BGN Premium wood self. Bottles can be stacked on sliding shelves, which the unit can hold up to 13 of and up to five (5) presentation shelves. Additional shelving packages can be purchased to meet your display and capacity needs. 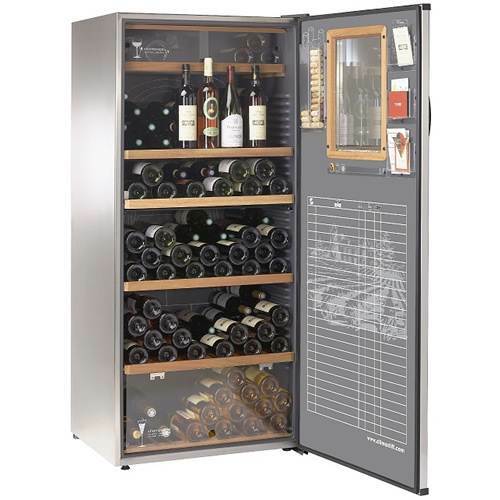 Keep your wine collection safely stored and at the perfect serving temperature, all the while being on display with the Climadiff Diva 265 Bottle Single Temp Glass Door Cabinet Wine Cooler. Temperature Range: Single adjustable temperature unit has an interior range of 46-64 degrees F with an ambient temperature range of 50-95 degrees F Glass Door: Full tempered, seamless and UV resistant door lets your collection stay safely stored for all the world to see Electronic Regulation: The digital control touch screen features a temperature and humidity display, cooling indicator, low water supple alert and low emission LED lights Note: This item is delivered using white glove service.